Whatever 'Christian Hedonists' might say, it is misguided to seek too much happiness in this life. 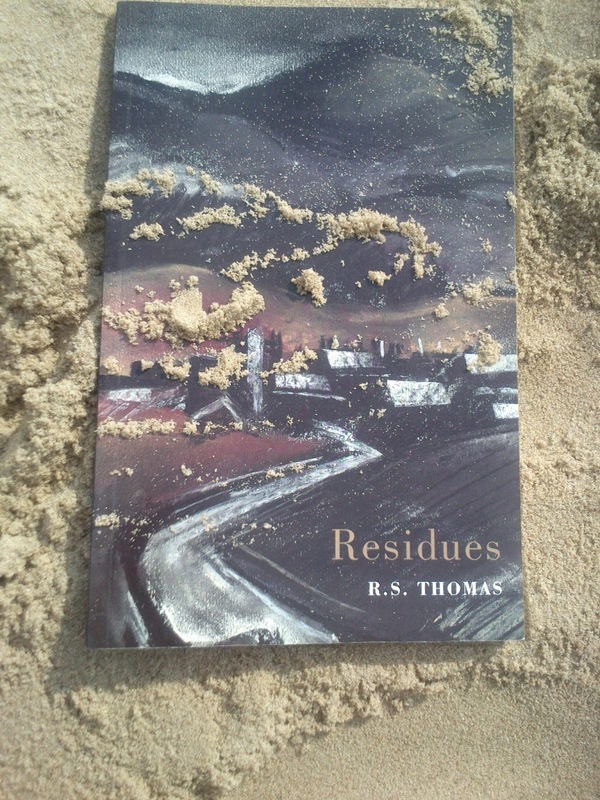 For that reason I opted to take R. S. Thomas with me on yesterday's trip to Bournemouth beach. Yep, it was the wife and I, and the 'ogre of Wales'. Well, not him personally, of course. I doubt he would have joined us for Bank Holiday jolly when alive. But he was present in the form of his posthumously published collection of poems, Residues. I've dipped into Residues many times over the years, but had never read the collection in order from cover to cover before. There are only seventy poems in the set and many of them are quite short, amounting to no more than eight or ten lines of text, sitting in isolated splendour at the top of an otherwise blank page. Several are more expansive page-fillers, but on the whole R.S. was austerely economical in his use of words, especially in his later works. Reading poetry is different from prose. Unlike the generous limpidity of prose, poems require careful thought and meditation before they will yield their meaning to the reader, and then perhaps not. It's slow work, which, for a generally fast reader involves something of a struggle to adjust to a more ponderous pace. We thought that Bournemouth would be quite congested on a Bank Holiday Monday and that it would be difficult to find somewhere to park. But but nothing of the sort. The roads weren't that busy at all and we managed to park in a side street around ten minutes walk from the beach. A quick trot down a zig-zag path and there we were, sand and sea invitingly before us. The beach wasn't too crowded either, considering the sunny weather. There is no point in visiting the seaside without having a dip in the sea. 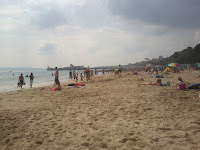 The water was pretty cold to begin with, but I soon got used to it and swam virtually the width between two of the many groynes that dissect Bournemouth beach . Dried off. Had a Mr Whippy 99 ice cream. 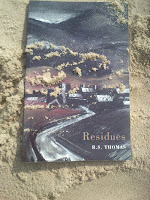 R. S. Thomas was a Church in Wales clergyman and a number of the poems in Residues touch on God and faith-related matters. In Watching he reflects that no amount of distance will turn the Maker of this sad world's 'wince into a smile'. He watches us from behind the 'cross that is the astigmatism in his vision'. On occasion Thomas feels that his faith 'was a plank to narrow for me to tread.' (Space Walking), while in other poems he conceives of prayer as so close to God 'as to open a crater in his composure'. (Launching a Prayer). It is certainly the case that the Lamb that was slain is in the midst of the throne. God's sovereignty is mediated through the Man of Sorrows. Yet, the cross shows that our Maker does more than wince at the pain of this sad world. He has acted in Christ to rescue the world from sin, sorrow, and death, and give us hope. It was hot enough in Bournemouth on Monday, but nowhere near as hot as the Algarve where we holidayed earlier in the month. But after spending several hours on the beach I fancied a wander. We took our stuff back to the car and headed for the pier. Didn't realise that you had to pay to enter, so we didn't. Had a fish and chip supper at the 'World Famous' Harry Ramsden's chippy. Good, but we thought that Champions at Westbury is better. In Class R.S. touches upon the perils of academic study. The professor may lecture on Blake and dilate on love and the other virtues, but has he forgotten what they mean? 'He who would pass the examination has dust at his heart.' warns Thomas. For similar reasons another, if quite different Welsh Minister, D. M. Lloyd-Jones insisted that there should be no examinations at the London Theological Seminary, the college he helped to found. The seminary, where I studied for the Ministry, is concerned solely with training men for pastoral-preaching work. Lloyd-Jones thundered, 'There is a sense in which it is almost blasphemous that there should be examinations in connection with this knowledge which which we are concerned.' And by that he meant experiential knowledge of God in accordance with his self-revelation in Holy Scripture. The study of biblical revelation is meant to set the heart ablaze, not simply enable a man to pass a test. What preachers need is fire, not dust in their hearts. by way of the heart. You're obviously not a Lloyd-Jones man; if I remember correctly he would take a volume of the Bampton lectures for beach reading. I have to grit my teeth whenever I hear the intellect/heart dichotomy. Biblically, the heart is the organ of thought (e.g. Prov 23:7).